Member of The Boys’ Brigade (BB) youth organisation past and present have marked the 135th anniversary of its founding. As part of the celebrations, a special service of thanksgiving was held in Edinburgh’s St Giles’ Cathedral on Thursday (4th October) where flowers were laid next to a plaque to the BB founder, Sir William Smith. The service was led by Rev Derek Gunn, national chaplain to the BB Scotland. The Boys' Brigade was founded in Glasgow on Thursday 4th October 1883. John Sharp, Director for Scotland for The Boys’ Brigade, attended the short service at St Giles’. “It’s been a chance to celebrate our history and our heritage, but also to look forward. Today we are working with thousands of young people in the UK and around the world. We are an organisation with a great past, but also a great present and future. “Hearing stories from around the Scotland of the impact The Boys’ Brigade has had on their lives is truly inspiring. John also highlighted the role volunteers play in delivering BB in communities across the country. Ronnie Campbell is Chairman of the BB Scotland committee and is also leader in charge of the 135th Glasgow company which is based in Scotstoun. He emphasised how much can be gained through volunteering. Kirsty Melville, 20, is a young leader with the 1st Monifieth company in Angus. Kirsty explained how much she gains from her volunteering with The Boys’ Brigade. “Volunteering is something I have always done but with the B.B. it doesn’t feel like volunteering it’s like visiting family. The bonds created with others of a similar mindset - no matter your background - is one that truly is unbreakable! "My anchors section consists of boys aged five to eight. It is incredibly rewarding to get to watch these boys grow and prosper over the three years." Former members of BB include many notable figures in sports, politics and wider society, including the current managers of both Scotland men’s national football and rugby teams – Alex McLeish and Gregor Townend. 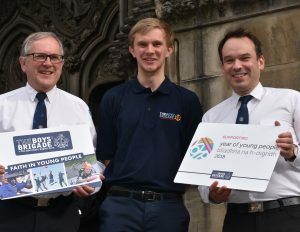 The Boys’ Brigade can also count on alumni such as Deputy First Minister John Swinney, Radio 2 DJ Ken Bruce and even London rapper Stormzy. Amongst others to pay tribute to The Boys’ Brigade’s 135 years of working with young people are personalities from the sporting world. Current manager of the Scotland national men’s football side, Alex McLeish, spent several years as BB member in Barrhead. Sports journalist and commentator Paul Mitchell is a former member of the 19th Leith in the Granton area of the city.